Further data on Lake Vostok resulted from two meetings following that at the Scott Polar Research Institute (SPRI) in 1995: (1) the International Workshop on "Lake Vostok Study: Scientific Objectives and Technological Requirements", 24-26 March 1998 at the Arctic and Antarctic Research Institute (AARI) in St. Petersburg, Russia, and (2) the "SCAR International Workshop on Subglacial Lake Exploration" held in Cambridge, England, September 1999. The meeting in St. Petersburg was intended to invite as many of the scientists from AARI as possible, some of whom had been involved in studies of the Vostok Station area for 41 years, since 1957. Scientists from St. Petersburg's State Mining Institute were also invited. That institute had been in charge of deep-core drilling through the ice sheet at Vostok Station for 26 years since 1971. It was this drill, operating at a depth of 3,623 m from a drilling rig at Vostok Station, that reached a depth only 130 m from the lake itself on the opening day of the workshop. Other Russian scientific institutions involved in the studies of Vostok ice cores and the lake itself were also present. One was the Institute of Microbiology of the Russian Academy of Sciences, represented by Dr. Abizov, who identified micro-organisms deep in the ice sheet below Vostok Station and who had been involved in its study for more than 20 years. St. Petersburg's Polar Marine Geological Research Expedition had been involved in remote sensing of the Vostok area for the last few years. After a welcome and introduction by the Director and Deputy Director of the AARI, a presentation by the Leader of the Russian Antarctic Expedition (RAE), Dr. Lukin, was made on the subject of "Russian Antarctic studies at Vostok Station''. The history of the discovery of the lake and possible means of further exploration were discussed, and new data was presented from new studies since the lake became a public issue. Foundation (ESF), the British Council and the U.S. National Aeronautics and Space Administration's (NASA) Astrobiology Program. The meeting in Cambridge was convened by Dr. Ellis-Evans at the request of the SCAR Executive and its President, Professor Rutford, and this choice determined the biological concern of the meeting in general. Scientists from the AARI, St. Petersburg's State Mining Institute, Laboratoire de Glaciologie et de Geophysique de l'Environnement, Grenoble, France, and Laboratoire de Modelisation du Climat et de l'Environnement, Saclay, France, reported that under the framework of Russian-U.S.A.-French collaboration on the Vostok ice core study, drilling operations at Vostok Station's "5G" borehole had proceeded after the Cambridge workshop of 1995. During the 1996-1997 and 1997-1998 field seasons the hole was deepened from 3,350 m to 3,623 m. A core from the lake's vicinity was taken through this depth also, and preliminary studies were made (Petit et al., 1998). It was shown that from the surface of the ice sheet down to 3,300 m depth, stable isotope, dust, and electrical conductivity measurements (ECM) are well preserved in the ice, offering a continuous climate record over the last 400,000 years. However, below 3,400 m the isotopes and ECM signals became smooth and it was no longer possible to decipher glacial-interglacial changes. This meant that two decades of drilling and the associated climatic studies of the Vostok core came to an end. The core has the unique distinction of providing access to the most extended undisturbed paleo-environmental series covering 420,000 years, including the last four climatic cycles (Petit et al., 1997). Rather than terminating the studies, however, new and interesting information began to appear. A very sharp and significant variation in stable isotope and dust concentrations around 3,320 m depth were found, which could not be of climatic origin. The ice stratum from 3,538 to 3,607 m depth displayed visible inclusions of millimeter size, which might have originated from bedrock. The layer also included very large crystals, meters in size (the diameter of the core was about 10 cm, its length was about 6 m - these large ice crystals could therefore only be measured along the length of the core). Electrical conductivity of this layer was two orders of magnitude lower than previous layers, but the stable isotope content was only slightly different. It was clear that a new area of the ice mass had been reached, but what did it represent? In answer to this question, the presentation by AARI scientists on the internal structure of the lower part of the Vostok ice core was of great interest at the time (Lipenkov and Barkov, 1998). The basal stratum, found beneath 3,538 m and traced downward to the bottom of the hole (3,623 m), is represented by silt-sized material comprising randomly disseminated moraine debris. The very bottom part (3,606-3,623 m) of the stratum appears to consist of relatively clean ice. The large crystal size (as much as lm or more) is of little help to determine the ice texture pattern (fabric). The presence of inner moraine in the basal stratum at Vostok implies that there is a probability for refrozen ice to be found at a distance of more than 100 m from the bottom of the ice sheet. It is interesting that in 2004, only 6 years after the workshop, the majority of scientists agreed that this bottom layer was formed by lake water freezing. Calculations of the scientific explanation of the possibility of freezing at the ice sheet-lake water interface below Vostok Station were also presented at this workshop (Salamatin, 1998). In the case that there was no shear deformation in the ice sheet above the lake, and strain heating in the glacier was negligible, the best fit between the computed and measured borehole temperatures at Vostok was found to be 0.043 Wm-2 for the bottom heat flux, resulting in a mean water freezing of 0.75 mm yr-1. This could result in a 20-30 m thick layer of newly frozen ice at the ice sheet bottom in the vicinity below Vostok Station. Three years (1996-1998) of seismic studies during St. Petersburg's Polar Marine Research Expedition by AARI in the vicinity of Vostok Station along the submer-idional and sublatitudinal profiles, and in the borehole itself, have shown that the ice sheet thickness at the location of borehole 5G-1 is 3,750m and there is an underlying water layer with a thickness (depth) of 670 m. The locations of remote-sensing data in the Lake Vostok area taken from 1959-2000, parts of which were discussed at these workshops, are shown in Figure 9.1. Discussions at the St. Petersburg workshop in 1998 resulted in new plans for future radio-echo sounding and seismic investigations (Figure 9.2). One of the reports of the workshop included a discussion on the tectonic setting of Lake Vostok (Leitchenkov et al., 1998). The lake is located at the edge of a large area of bedrock beneath the thick ice sheet of East Antarctica, which is interpreted as a Precambrian crystalline shield. Bedrock topography and geophysical data available for this region suggest that Lake Vostok is associated with an intercontinental rift zone similar to those of other regions on Earth (e.g., rifts of East Africa, the Baikal Rift, the St. Lawrence Rift, and others) (Figures 9.3 and 9.4). It should be emphasized here that the main borehole at Vostok Station, and the spot of the first seismic sounding by Kapitsa are located surprisingly close to the shore of the lake. The coastline of Lake Vostok is positioned at a distance of only 3 km west, 4 km east, and 4 km south-westward of borehole 5G-1, which are of nearly 1% of the lake's length. The measured ice thickness to the north of Vostok Station along a submeridio-nal 6km long profile was the same as for borehole 5G-1, about 3,750 m. The distance from the bottom of the hole and the ice-water boundary is 130 m (Popkov et al., 1998). The water layer under the ice was measured remotely, showing a change in thickness (depth) from 490 m at the southern part of the profile to 670 m at its northern part. Figure 9.1. Location of remote-sensing data in the Vostok area from 1959-2000. 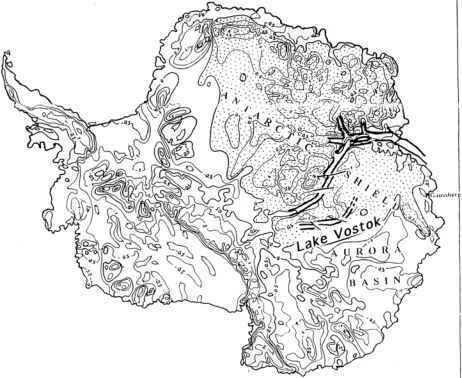 The location of Lake Vostok is shaded (adapted from Masolov et al., 1999). 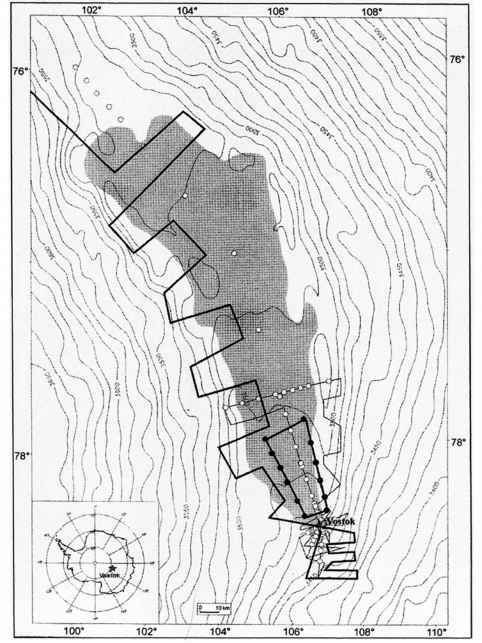 Notation: RSS - reflection seismic soundings; RES - radio-echo sounding; PMGRE - Polar Marine Geological Research Expedition (Russia); AARI - Arctic and Antarctic Research Institute (Russia); ANARE -Australian National Antarctic Research Expeditions; SPRI - Scott Polar Research Institute (England); NSF - National Science Foundation (U.S.A.). Figure 9.2. Over-snow radio-echo sounding (thick lines) and reflection seismic sounding (dots) investigations planned by the Polar Marine Geological Research Expedition as a part of the Russian Antarctic Expedition for 2000/2001. Thin lines and open circles indicate earlier surveys. Ice surface elevation contours are in meters (adapted from Masolov et al., 2001). Figure 9.3. Location of the Lake Vostok Rift in the tectonic structure of Antarctica (adapted from Leitchenkov et al., 1998). The stippled area represents the inferred Antarctic Precambrian Shield; thin lines - bedrock topography contours; thick lines - rift zone boundaries. 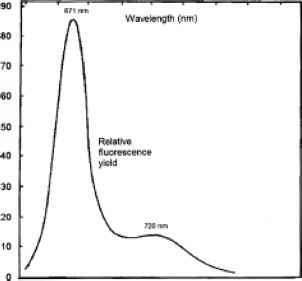 Figure 9.4. 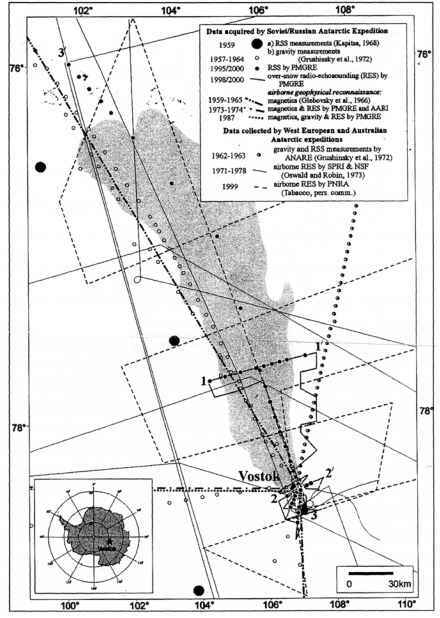 Aerogeophysical investigations planned by the U.S. Antarctic Research Program (USARP) for 2000/2001 (thin lines) and the proposed area for investigation by the Polar Marine Geological Research Expedition (Russia) for subsequent years (shaded) (adapted from Masolov et al., 1999). 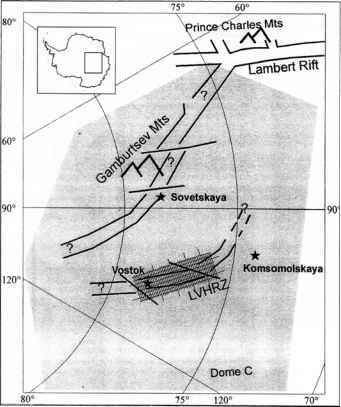 Notation: LVHRZ - Lake Vostok Hypothetical Rift Zone. (Location of USARP flight lines courtesy of Dr. Bell). nutrients are likely to concentrate. Assuming some degree of mixing in the water column and a lack of nutrients the obvious area to search for microbes will be the sediments and the ice-water interface where surfaces abound and chemical gradients are likely. Nutrients are present in sediments but will require considerable energy outlay to become available. Is this energy available? Evidence from maritime Antarctic lakes isolated in both batch and chemical culture suggests that the majority of these isolates can tolerate exceptionally low levels of C and N. Most of the aquatic microbes are thought to live naturally in a state of long-term starvation broken by occasional 'feasts' ... Certain fundamental maintenance processes have to occur within a microbial cell for life to continue and this is an inescapable drain of cell resources. Bacterial spores have taken the survival process to an excep tional degree but still have limits, and spore-formers are not that common in Antarctica. [In contrast, Dr. Abizov has now shown that this is not the case for the deepest horizons of the Vostok ice core.] The reality in most low nutrient environments will be that lysed microbes provide much of the nutrient supply so that circling is tightly bound. Will this impose limitations on species diversity and will processing of micro-molecules be limited because of the high energy demands involved in these processes? In many cold aquatic environments, macro-molecule breakdown is the major limiting step in nutrient circling and this may be an even larger hurdle in Lake Vostok. Dr. Vorobieva and Dr. Gilichinsky (Soil Science Department of Moscow State University and Institute of Soil Science and Photosynthesis of RAS) raised an optimistic point at the workshop, emphasizing that a high abundance of microbial biomes in Antarctic permafrost conditions, presence of quick reparated cells and signs of cell stabilization, and preservation of taxonomical and physiological diversity of microbial communities are all indications of microbial adaptations to long-term cold (Vorobieva et al., 1998). With that in mind, it is possible that mechanisms of microbial survival are universal in a wide range of water-gas-mineral systems, and optimism is increasing in the search for life beyond Earth. Dr. Doran pointed out that deep ice-covered lakes in the dry valleys of Victoria Land should be viewed as aquatic analogs of the Lake Vostok environment. "Like the dry valley lakes the Lake Vostok ecosystem will be entirely microbial, and metabolism extremely slow. In both systems there is a water body accepting microbes and organic carbon from an overlying ice cover, even though there is no light penetration in the dry valley lakes or in Lake Vostok. The dry valley systems are archaic with long residence times. Atmospheric gases in Lake Vostok may be supersaturated as they are in the dry valley lakes...'' (Doran, 1998). A new branch of science, that could be called extraterrestrial studies, was included in the meeting - Drs. Carsey, Cutts, and Harvath from the Jet Propulsion Laboratory of the California Institute of Technology introduced a proposal to NASA and the U.S. NSF, as well as to the international community on robotic exploration of Lake Vostok. This exploration is perceived to be closely related to the deep subsurface exploration of other planetary sites, especially Europa, a moon of Jupiter, in the more distant future.